Cat 14 L AWD motor grader ... powerful and fuel efficient. Sharjah-based Mohamed Abdulrahman Al Bahar – which represents Caterpillar in Bahrain, Kuwait, Qatar and the UAE, as well as in Oman through its associate Oasis Trading and Equipment Company – organised an Oman Open Day in Muscat from April 28 to 29, showcasing the company’s latest machines including the 14 L AWD (all-wheel-drive) motor grader, the Cat 950 GC wheel loader and four excavators from the Cat D2 Series. Making a presentation on the occasion, Oasis Trading general manager Bashar Barghouti said the company plans to expand its presence in Oman. “Currently, we have three fully operational branches at Muscat, Salalah and Sohar comprising offices, spare parts warehouses and service workshops. “In addition, we will be opening depots in Nizwa (200 km from Muscat) and Jaalan (253 km from Muscat) by September, covering the interior regions of the sultanate,” he said. The Open Day, highlighting ‘Pure Innovation’ from Cat, saw some 20 machines on display – ranging from hydraulic and wheel excavators to wheel loaders, backhoe loaders, telehandlers, skid-steer loaders, motor graders and soil compactors. Barghouti said Mohamed Abdulrahman Al Bahar, which was founded in 1937, has been the official dealer of Cat in the Gulf for more than 60 years. Oasis Trading, which was set up in Oman in 1976, now has 280 experienced and trained employees and five-star workshop facilities. Al Bahar, which has established a reputation for delivering around-the-clock product support, has expanded to 11 branches with more than 2,000-plus knowledgeable and experienced staff providing a thorough sales and service support in the region, including remote areas. Cat 950 GC wheel loader ... exceptional value. At any given time, the company’s product support has 1.3-million-plus parts available over 63,000 plus lines, he said. Introducing the 14 L AWD, Cat Heavy Construction & Quarrying application specialist Gary Martin said Cat motor graders build on their reputation for offering world-class cab and controls, advanced electronics and hydraulics, and optimum productivity to match any needs in any application. 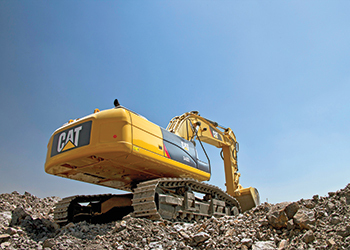 “The safety of operators and those on the job site is key in the design of every Cat machine. Features like outstanding visibility, hydraulic lockout and redundant steering and braking systems help meet safety goals,” he said. In soft underfoot conditions where traction can be a challenge, the optional AWD gives the additional power to work more efficiently in mud, gravel, sand or snow. The added traction helps reduce sliding on slopes. 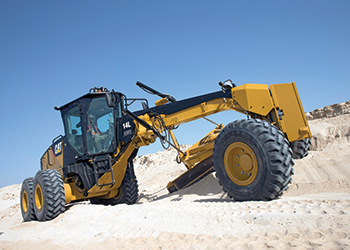 Introducing the Cat 950 GC wheel loader, Amr Abaza, Cat sales representative, said it has proven components, durable structures and operator amenities to provide great customer value. The new wheel loader combines low operating costs with the durability, reliability and economy of proven Cat components to deliver productive performance in a wide range of five-tonne wheel loader applications. “The result is a machine of exceptional value at an affordable price,” he said. 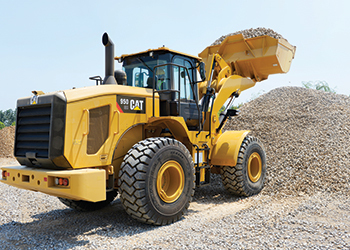 The 950 GC’s list of features is impressive: heavy-duty frames; Cat Z-bar linkage; Performance Series buckets; fuel-efficient Cat C7.1 engine; powerful load-sensing hydraulics; spacious, air-conditioned cab with intuitive controls; and unsurpassed support from Caterpillar’s worldwide dealers, he added. 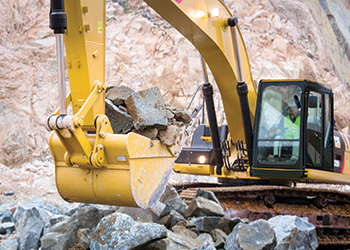 The 950 GC is well-suited for stockpiling, truck loading, material handling, hopper charging and load-and-carry work in applications such as quarries, sand and gravel pits, storage yards, concrete and asphalt plants, and on construction projects for job-site preparation, back-filling, pipe handling, and general clean-up. The new loader also is an exceptional choice for governmental bids, offering agencies a well-designed, durable machine that fits the budget. The new Cat 340D2 L hydraulic excavator … fuel savings. The 950 GC complements Caterpillar’s current wheel loader product line. The new Cat D2 Series excavators that showcased their prowess during the Open Day were the Cat 320D2, 329D2, 336D2 and the 340D2 L.
The Cat 320D Series 2 hydraulic excavator features a new fuel-efficient engine, a powerful hydraulic system, simplified maintenance and refined operator station. Built on the solid performance of its 320D predecessor, the new 320D Series 2 excavator is an exceptionally reliable, highly productive machine that lowers operating costs through reduced fuel consumption and simplified routine maintenance. The 320D/D L Series 2 uses a Cat C7.1 engine that meets US EPA Tier Two, EU Stage Two. The new engine, rated at 104 kW (139 hp), uses an electric governor to control the mechanically actuated, low-pressure, fuel-injection system. The system ensures optimum performance and reliability in areas where fuel quality is less than premium. A new filtration system uses a primary fuel filter/water separator and a secondary fuel filter to ensure clean fuel throughout the system. The field-proven C7.1 engine is designed for ease of service and can work efficiently at altitudes up to 4,000 m. An automatic engine-speed control lowers engine rpm (revolutions per minute) during no-load or light-load conditions to minimize fuel consumption. Meanwhile, the new Cat 329D2 excavator features world-class design, powerful performance, and low fuel consumption. With a maximum operating weight of 30,115 kg and a net power rating (ISO 9249) of 151 kW, the 329D2 is designed for high productivity, versatility, low operating costs and exceptional reliability. The Cat C7.1 engine is equipped with a three-stage fuel-filtration system for optimum protection of fuel-delivery components. Premium features include cross-sensing hydraulics for greater efficiency, robust major structures for long-term durability, ergonomic cab for increased productivity, and simplified routine maintenance for reduced owning and operating costs. The new Cat 336D2 is a powerful, productive, 36-tonne-class machine that adds technical refinement to the solid design of its 336D predecessor. Reliability and durability remain the foundation of the 336D2, and more customer value has been added through an improved fuel system that enhances reliability and helps reduce fuel consumption. It also offers the benefits of an enhanced hydraulic system, operator convenience and safety features, simplified routine maintenance, and versatile performance with a range of Cat work tools, providing a highly productive, fuel-efficient machine for demanding heavy-duty construction projects. The new 320D Series 2 excavator ... reliable. Finally, the new Cat 340D2 L hydraulic excavator demonstrates productive performance and durability with a refined hydraulic system and a fuel-efficient Cat C9 engine that meets US EPA Tier 2, EU Stage Two. With an operating weight of 40,270 kg, the new excavator features massive structural components; heavy-duty undercarriage; a selection of booms, sticks, and work tools for optimum versatility; and a spacious, comfortable cab with low-effort, pilot-operated joysticks and a pressurisation system for a dust-free environment. The Cat 340D2 L is designed for maximum fuel savings, reduced operating costs, long-term durability, and powerful hydraulic performance. Also present at the Open Day was John S Taylor, chief operating officer of Sitech Gulf, a division of Mohamed Abdulrahman Al Bahar and the exclusive outlet for CAT AccuGrade and Trimble GCS machine control products. “Our goal is to help construction companies in the GCC implement machine control technology effectively and efficiently,” he said. While the 2D system maintains constant slope of the grader blade and is an economical solution to increase production and quality, the 3D system has a GPS (global positioning system) satellite receiver, control box with complete design information and maintains precise grade at all times, explained Taylor.